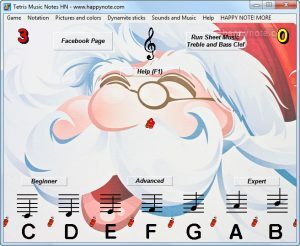 From this page, everybody can learn to read music notes easily and quickly, for free. Let’s go right now! Or just keep reading this page and check the two annotated images about G and F clef below. What clef do you need to learn to read the sheet music of your instrument? The G clef, called treble clef, is used on sheet music for piano (right hand), guitar, violin, flute, oboe, clarinets, saxophones, horn, trumpet… For the singers, the Treble clef is used with the following voices: tenor, contralto, alto, mezzo-soprano, soprano. The treble clef (G clef) is placed on the second line of the staff. So, the music note on the second line is a G.
The F clef, called Bass clef, is used on sheet music for piano (left hand), cello, double bass, bass guitar, bassoon, trombone, tuba, timpani… Baritone and bass voice use the Bass clef too. The bass clef (F clef) is placed on the fourth line of the staff. So, the music note on the fourth line is a F.
How do you want to name the music notes: A B C D E F G or DO RE MI FA SOL LA SI? Mainly used in Anglo Saxon countries (and so in jazz), the alphabetical musical notation uses the letters of the alphabet: A B C D E F G.
The Syllabic musical notation – DO RE MI FA SOL LA SI – is used by Italian, Portuguese, Greek, French, Russian, Flemish, Romanian, Spanish, Hebrew and Turkish people. To learn more, follow name of music notes. How to learn to read the notes in a progressive and easy way with color music notes? Right now, we are going to name the notes both “A (la) B (si) C (do) D (re) E (mi) F (fa) G (sol) and use the treble clef. But you’ll find four links at the end of this page, to choose between G and F clef, A B C and DO RE MI name of notes. Let’s go: Your first music reading with a color note! Your first music (musical) reading is the “2a” with only C (do) and G (sol). “2” means 2 different notes, “a” means the new music note to learn, here the C, is in color. Music reading “2a” in G (treble) clef with C(do) and G (sol). The new music note to learn, the C(do), is in color. You must say or better sign the name of the note exactly while you hear it. This way, not only you’re going to learn to read music, but also learn to “keep the beat”. That is, reading a sheet music without speeding up or slowing down. This is something that is truly essential when playing a musical instrument. When you can read easily the “2a” musical reading, it’s time to read the “2b”. Music reading “2b” in G (treble) clef with C (do) and G (sol). The previous new music note, the C (do), is now in black, your must read it without the help of color. The “b” musical readings never add a new note to learn. But the previous color note is always in black. Now, you must read the C note without the help of color. Again, you must say or better, sing – this way, you’re also making ear training! – the name of the note exactly when you hear it, not before or after. When the music reading “2b” has became easy for you, you can learn to read a new music note. After the “2b” musical reading, there is the “3a”. “3” meaning three notes, “a” meaning the new note to learn is in color. Music reading “3a” in G (treble) clef with C (do), G (sol) and E(mi). The new music note to learn, the E(mi), is in color. You must read the music notes of each musical reading easily and without hesitation. Ideally, when you’re telling the name of a note, you should already being looking and reading the following one. And then, you can go to the “3b” reading, where you’ve to read the E (mi) note without the help of color. Music reading “3b” in G (treble) clef with C (do), G (sol) and E (mi). The previous new music note, the E (mi), is now in black, your must read it without the help of color. Music reading “4a” in G (treble) clef with C (do), G (sol), E (mi) and D (re). The new note to learn, the D (re), is in color. As this point, you understand how it’s easy to learn to read music with the “a” and “b” musical readings. And in addition, we offer you others options below. Choose your link below. Or even better, select it by using the main menu of this page, option Read Music Notes. You find the readings too slow or too fast? Have a look at Read Music Notes Sing’n Learn HN. The program offers a choice of 5 different speeds: Largo, Adagio, Andante, Moderato, Allegro. Available with Windows 10, 8, 7, Vista, XP. Read Music Notes Sing’n Learn offers a choice of five different speeds. Sure! Try our video game Sheet Music Treble Clef and Bass Clef HN with tons of options. Available with Windows 10, 8, 7, Vista, XP. With Sheet Music Treble Clef and Bass Clef HN you can choose the music notes you want to learn or improve. A true video game with Lives, Hi-Score, Beginner and Expert Mode, Dynamite Stick (optional), etc. Try Read Music Notes HN. You can play online or download the Android version on Google Play. And there are direct links to the musical readings, from “2a” to “17b”. 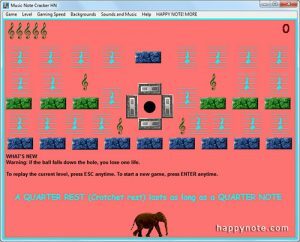 A breakout game to learn music rests (half rest, quarter rest…) the fun way. 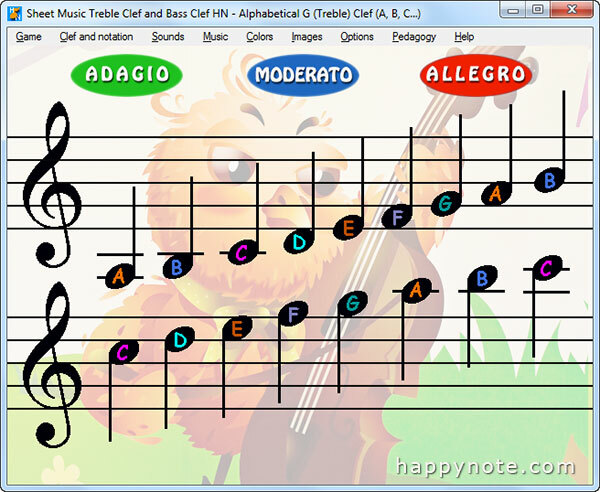 Check your reading in treble clef with Tetris Music Note! Piano Keys HN let you learn easily the white and black keys of a musical keyboard. For the black keys, you can choose between the # (sharp) and the b (flat) or both alterations together. Learn the black keys (sharps and flats music notes) and white keys of a piano keyboard with a game.